There are considerable benefits in encouraging interdisciplinary research, particularly where the objective of the research is to achieve useful economic, social, environmental or cultural outcomes. The real world does not always present its problems and opportunities conveniently aligned with traditional academic disciplines so mechanisms are needed to facilitate interactions and collaborations between researchers working in widely different fields. Making Interdisciplinary Research Work (ARC Linkage Learned Academics Special Projects Funding 2010 project LS1000004) commenced in 2010 as a multiphase, multiyear, project in order to address two outstanding problems: the application of interdisciplinary research to broad, problem-based research and how to use this understanding to find effective ways of approaching the array of challenges confronting Australia. The project comprised several components. Strengthening interdisciplinary research. What it is, what it does, how it does it and how it is supported? Professor Gabriele Bammer. February 2012. Article in the Australian, The case for a team research framework, 28 March 2012, written by Professor Gabriele Bammer. 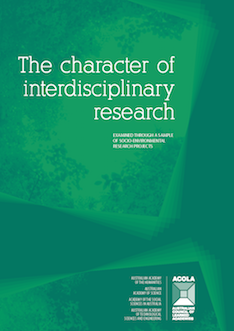 This second and third component of the program, The character of interdisciplinary research – examined through a sample of socio-environmental research projects, builds on the foundation established in Strengthening Interdisciplinary Research, examining in detail interdisciplinary research related to environmental sustainability. A short guide to the report. The Character of Interdisciplinary Research. (9MB) The Character of Interdisciplinary Research. Examined through a sample of socio-environmental research projects. Professor Michael Webber, FASSA. 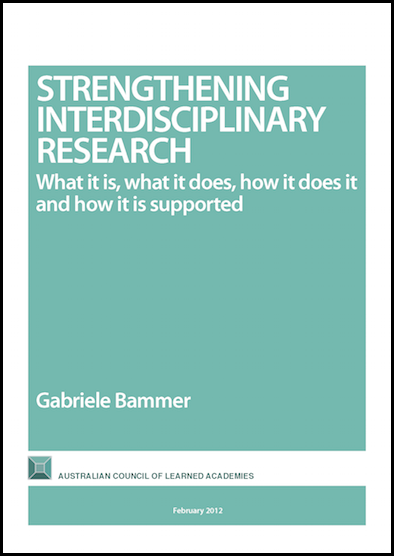 The final component of Making interdisciplinary research work will road test the model of interdisciplinary research developed in the first two reports using a ‘live’ scenario to address one of the key challenges confronting Australia today. 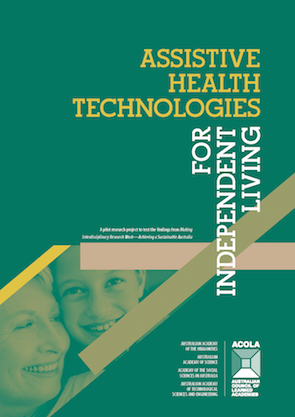 Assistive Health Technologies for Independent Living: A Pilot Study will look at the need to enable elderly and disabled individuals to live longer within their own home through the application of smarter and more cost-effective approaches to assistive technologies. The project will explore the benefits of an interdisciplinary approach to the technological, social and ethical issues surrounding technology- based solutions for aged and disabled housing. 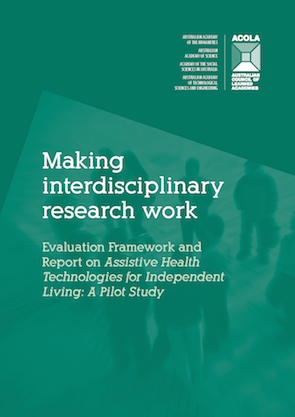 The practicality, usefulness and relative importance of including (or omitting) the key considerations identified to date by Making interdisciplinary research work will be monitored during the execution of the final project.